1Maliba Pharmacy College, Bardoli, 394350, Gujarat, INDIA. 2Shree Naranjibhai Lalbhai Patel College of Pharmacy, Umrakh, 394345, Gujarat, INDIA. Objective: To develop a novel analytical method for simultaneous determination of two triterpenic acids by high-performance thin layer chromatography in methanol and dichloromethane extracts of Eucalyptus globulus leaf. Ursolic acid was also isolated from Eucalyptus globulus leaf. Materials and Methods: Two triterpenic acids (ursolic and oleanolic acid) were extracted using methanol and dichloromethane as the extraction solvents. Study for total triterpenoids present in Eucalyptus globulus leaves was carried out which shows considerable amount of terpenoids present. Because of the similarity of chemical structure, the prechromatographic derivatization was necessary to separate these triterpenic acids. The samples were treated by 1% iodine solution in chloroform directly on the chromatographic plate and developed with the mobile phase consisting of petroleum ether, ethyl acetate and acetone (7.8:2.2:0.1, v/v/v). After drying, the plates were sprayed with 10% (v/v) ethanol solution of sulfuric acid and heated to 120 °C for 3 min. Quantification was performed in absorbance/transmittance mode at a wavelength of 345 nm. The developed HPTLC method was validated for linearity, precision and accuracy. Results: Correlation coefficient (r2 > 0.99), R.S.D. values, detection limits as well as recovery values were found to be satisfactory. Ursolic acid was isolated from E. globulus leaves. 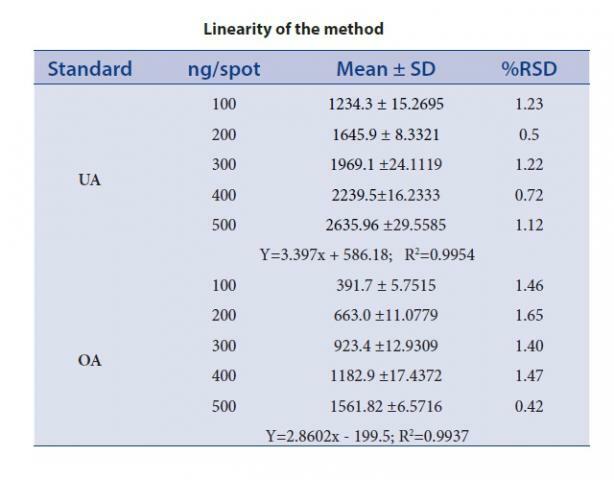 The identification of isolated ursolic acid was done on the basis of Rf value (0.26) for HPTLC and peak interpretation for FT-IR. Conclusion: The method has been successfully applied in the analysis of both triterpenic acids in medicinal herbs. Gupta A, Maheta P, Chauhan R, Pandey S, Yadav JS, Shah S. Simultaneous Quantification of Bioactive Triterpene acids (Ursolic acid and Oleanolic acid) in Different Extracts of Eucalyptus globulus (L) by HPTLC Method. Pharmacognosy Journal. 2018;10(1):179-185.